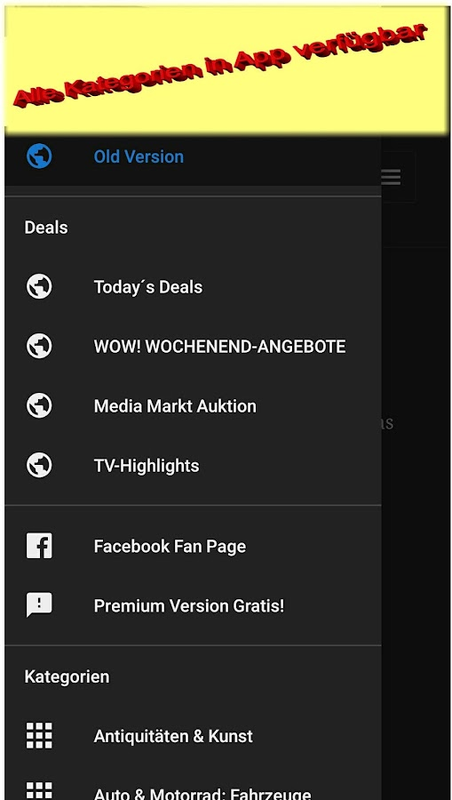 With this app you can find Ebay auctions from all categories whichare ending soonest and don´t get over 1 EuroThis is the Premiumversion of the app with advertising inside the App.What is thediffrence?The Premium Version has all Categories inside the App andnot on a external PageFirst try the free version if you like them,then use the premium features for better performance and fasterbargain hunting.Get a hunter for new deals on Ebay- This is not anofficial EBAY APP -For tips and suggestions I'm open, but pleaseconsider that I have made the app alone, no 10 man sitting behindme and helped to make that all possible. 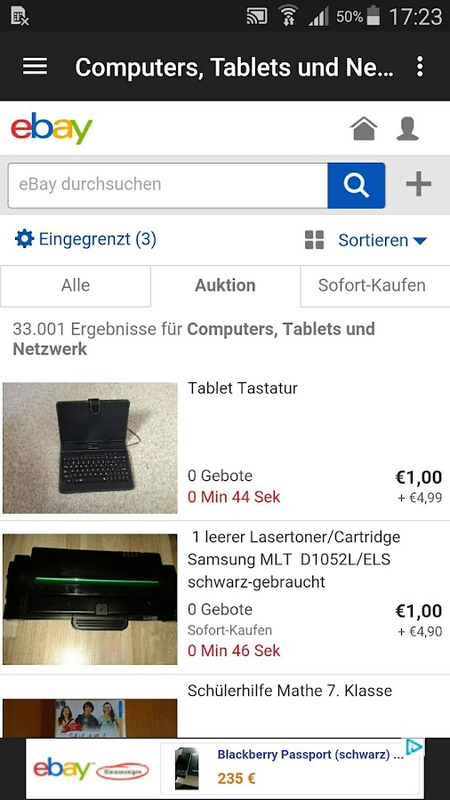 With this app you can find Ebay auctions from all categories whichare ending soonest and don´t get over 1 EuroThis is the Freeversion of the app with advertising inside the App.First try thefree version if you like them, then use the premium features forbetter performance and faster bargain hunting.Get a hunter for newdeals on Ebay- This is not an official EBAY APP -For tips andsuggestions I'm open, but please consider that I have made the appalone, no 10 man sitting behind me and helped to make that allpossible. Immer die neusten Nachrichten auf dem TelefonJede Stunde neusteNachrichten aus den Bereichen:- Aktuelles- Wirtschaft- Politik-Panorama- Gesundheit- Multimedia- Sport- Auto- Reise- Verbraucher-Wissenschaft- Job&Karriere- Tipps&Service-HistoryZusatzfunktionen:- Benachrichtungsintervall einstellbar-Benarichtigung per Flashlight bzw. 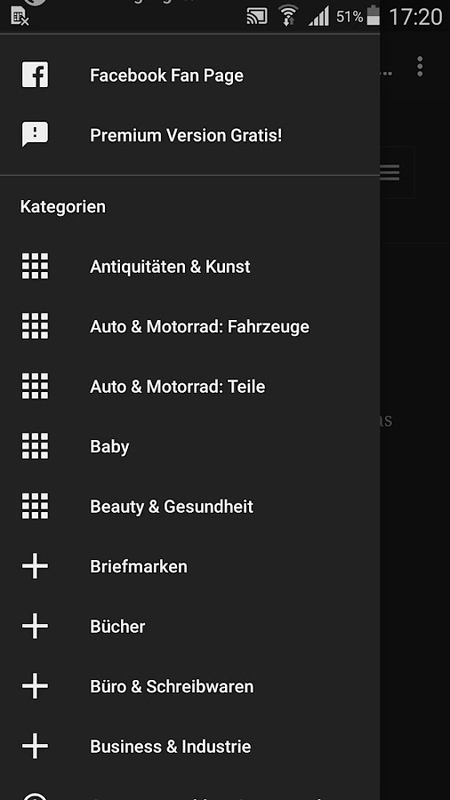 LED möglich- Nachrichten werdenmit Bilder angezeigt- 2 Themes zur Auswahl- Teilen Funktion ( z.Bper Whatsapp per E-mail oder Facebook)- Vibrationsbenachrichtigung-Sortierfunktion- Layout änderung möglichJetzt runterladen und immerauf dem aktuellsten Stand bleiben! !Always the latest news on yourphoneEvery hour the latest news from the areas of:- News- Economy-Politics- Panorama- Health- Multimedia- Sports- Car- Travel-Consumer- Science- Career opportunities- Recommendations &Services- HistoryAdditional functions:- Benachrichtungsintervalladjustable- Benarichtigung per Flashlight or LED possible- Messagesare displayed with pictures- 2 themes to choose from- Sharefunction (eg via Whatsapp via e-mail or Facebook)- Vibration Alert-Sort function- Layout changes possibleDownload now and stay up todate !! Snipe to win on eBay.Myibidder Bid Sniper is a sniper for eBaybuyers that places the last seconds bids to increase your chancesto win.No need to watch for auctions anymore, just set a snipe andlet the sniper do the job for you.Once the snipe is set, you don'tneed to keep the app running for the snipe to work.Required tostart:1. Create an account for sniping from within the app or usinghttps://www.myibidder.com/login/signup2. Link your eBay account tothe sniper from within the app or usinghttps://www.myibidder.com/main/ebayStep by step instructions on howto add an item forsniping:http://www.myibidder.com/forums/viewtopic/3719/howto-how-to-add-a-snipe-to-android-app/========================================================Forthose who never used eBay sniper in the past:1. SNIPING DOES NOTGUARANTEE WINNING. YOU HAVE TO MEET EBAY'S AND SELLER'SREQUIREMENTS IN ORDER TO WIN.ALSO, YOUR SNIPE MUST BE READY (ADDED& ACTIVATED) AT LEAST 3 MINUTES IN ADVANCE.2. YOU CAN STOPSNIPING IF YOU HAVE AT LEAST 1-2 MINUTES TO GO BY SETTING "OFF" ON"Activate Snipe" AND SAVING YOUR CHANGES.3. 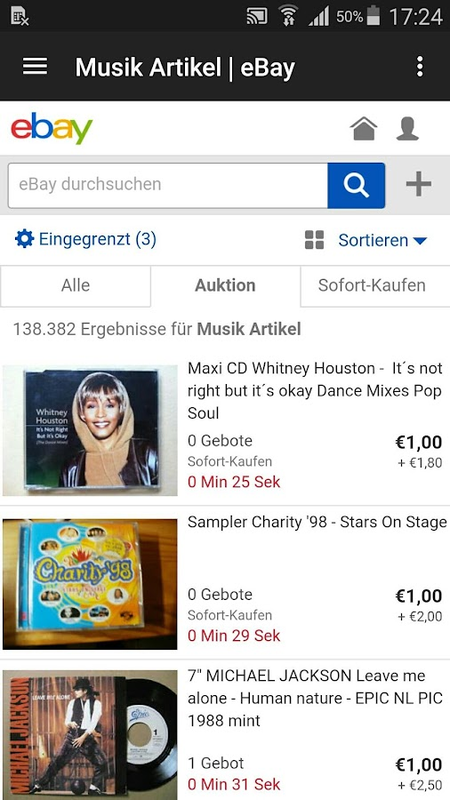 IT'S ALSO TECHNICALLYNOT POSSIBLE TO SHOW THE CURRENT BID IN REAL-TIME IN THE APP. IT'SPARTIALLY AVAILABLE IN PRO VERSION. THE CURRENT PRICE DOES NOTAFFECT SNIPING ANYWAY.Questions? Want to get answers? Please feelfree toask:http://www.myibidder.com/forums/========================================================CURRENTLIMITATIONS:a. No Groups management (Get the Pro version if youneed Groups)b. Does not refresh information automatically so if youmiss snipe status, you have to do "Refresh" from the My MainMenu========================================================Theapplication uses Myibidder.com service (originally namedMyibay.com) to place your snipes, so you can turn off or disconnectyour phone after you scheduled your snipe.Currently, the serviceprocesses over 150,000 snipes weekly.Sniping is done using eBay USby default.The service is supported by donations of ourusers:http://www.myibidder.com/login/donateMake sure you have atleast 3-4 minutes before auction ends when scheduling yoursnipe.Security tokens has very limited support. It's recommendednot to use it when sniping. Please contact support for moredetails.By using Myibidder.com service you have to agree to thefollowing terms:http://www.myibidder.com/login/termsPlease note thecomments on Android Market are NOT for bug reports and suggestions.If you want to suggest something or found a bug to be fixed, pleaseuse the following Myibidder.com official forums for bug reports andsupport:http://www.myibidder.com/forums/view/10/mobile-android-ios-app-support/Itwill not be fixed if you don't let us know on theforums.Permissions used:Internet connections: the app needs to beable to make connections in order to schedule snipes, retrieve yoursnipes information, etc.Read logs: the app reads its own logs anderror messages in order to properly address each crash. It does NOTaccess your personal information. Geoship - Search for eBay is a search engine based onhttp://geo-ship.com service which presents global eBay searchresults on the same page. Want to search all international eBaysites at once? Want to get offline notifications for watched items?Want to block untrustworthy sellers? Wish to know what other buyerssay on the item you want to buy? If the answer is yes then this appis for you! The key features: * Search all eBay sites at once fromone page * Offline notifications for ending of watched eBay items,even without internet connection * Block unwanted eBay sellers andcountries * Unlimited saved searches with configurable notificationengine * Find eBay item feedback left by other users that havebought the item * Completed and sold eBay items filters (useful forsellers research) * Prices are displayed in user defined currency *Unique search filters: seller feedback range * Unique sortingcriteria: total price, shipping, bids count, item location *Friendly and simple interface Important note: We are not theproviders of the products, we only search stuff on eBay, theproduct itself shipped and bought from eBay sellers. Please help tomake the application better by reporting any bug you have found.Any suggestions are also welcome. Snipe to win on eBay.Myibidder Bid Sniper is a sniper for eBaybuyers that places the last seconds bids to increase your chancesto win.No need to watch for auctions anymore, just set a snipe andlet the sniper do the job for you.Once the snipe is set, you don'tneed to keep the app running for the snipe to work.The Pro versionadds Groups support (set a bunch of items for sniping in the sameGroup, set limit how many to win. The sniper will stopautomatically after it reached your limit).You have to enableGroups in Preferences (open the menu on "Main Menu" screen, click"Preferences", check "My Groups").It also adds "Current bid" field.This is not a real-time update, this is the current bid of the lastmanual Refresh of the listing.To start:1. Create an account forsniping from within the app or usinghttps://www.myibidder.com/login/signup2. 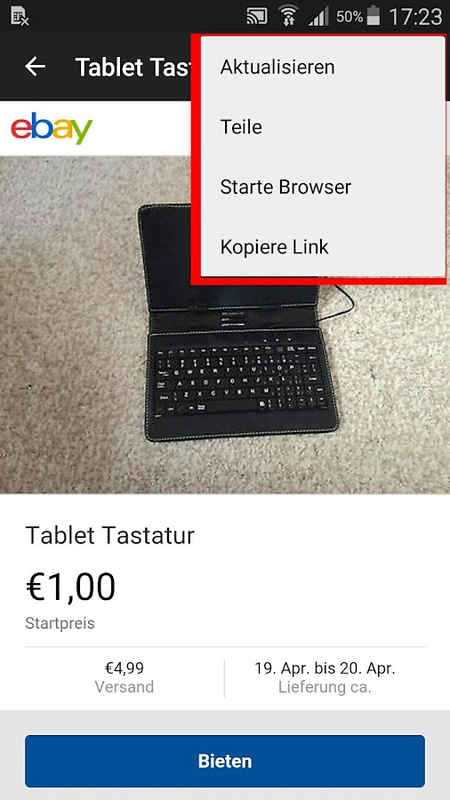 Link your eBay account tothe sniper from within the app or usinghttps://www.myibidder.com/main/ebayStep by step instructions on howto add an item forsniping:http://www.myibidder.com/forums/viewtopic/3719/howto-how-to-add-a-snipe-to-android-app/========================================================Forthose who never used eBay sniper in the past:1. SNIPING DOES NOTGUARANTEE WINNING. YOU HAVE TO MEET EBAY'S AND SELLER'SREQUIREMENTS IN ORDER TO WIN.ALSO, YOUR SNIPE MUST BE READY (ADDED& ACTIVATED) AT LEAST 3 MINUTES IN ADVANCE.2. YOUR SNIPING LISTIS DIFFERENT FROM ITEMS YOU PLACED YOUR BIDS ALREADY.3. YOU CANSTOP SNIPING IF YOU HAVE AT LEAST 1-2 MINUTES TO GO BY SETTING"OFF" ON "Activate Snipe" AND SAVING YOUR CHANGES.4. GROUPED ITEMSMUST BE AT LEAST 1 minute APART FROM EACH OTHER, OR YOU MAY WINTHEM ALL.5. IT'S ALSO TECHNICALLY NOT POSSIBLE TO SHOW THE CURRENTPRICE IN REAL-TIME IN THE APP. THE "CURRENT BID" IS THE BID SINCEYOUR LAST REFRESH.Questions? Want to get answers? Please feel freeto ask:http://www.myibidder.com/forums/Android Market is not forquestions or suggestions. We have no way to contact you back andanswer you throughfeedbacks.========================================================CURRENTLIMITATIONS:a. Does not refresh information automatically so if youmiss snipe status, you have to do "Refresh" from the My MainMenuThe application uses Myibidder.com service (originally namedMyibay.com) to place your snipes, so you can turn off or disconnectyour phone after you scheduled your snipe.Currently, the serviceprocesses over 150,000 snipes weekly.Sniping is done using eBay USby default.The Myibidder.com service is completely free. No monthlyfees, no per-auction fees, nothing.The service is supported bydonations of our users (such as purchasing thisapplication):http://www.myibidder.com/login/donateThis applicationis in Beta stage, it's a proof of concept and testing userinterface design. However, it's capable of placing real snipes onreal eBay listings.There are few bugs here and there, but it shouldnot affect sniping.Make sure you have at least 3-4 minutes beforeauction ends when scheduling your snipe.Security tokens has verylimited support. It's recommended not to use it when sniping.Please contact support for more details.By using Myibidder.comservice you have to agree to the followingterms:http://www.myibidder.com/login/termsThe comments on AndroidMarket are NOT for bug reports and suggestions. If you want tosuggest something or found a bug to be fixed, please use thefollowing Myibidder.com official forums for bug reports andsupport:http://www.myibidder.com/forums/view/10/mobile-android-ios-app-support/Itwill not be fixed if you don't let us know on theforums.Permissions used:Internet connections: the app needs to beable to make connections in order to schedule snipes, retrieve yoursnipes information, etc.Read logs: the app reads its own logs anderror messages in order to properly address each crash. It does NOTaccess your personal information.